"The use of high-quality genetic mutant reference collections has shown to be an alternative to genetic transformation techniques for the characterization of essential traits in other crops. 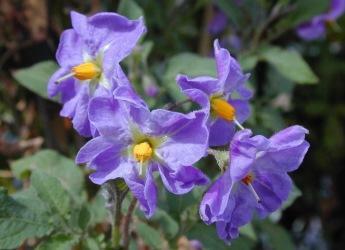 Potato (Solanum tuberosum L.) is a major food crop and is cultivated for its starch and nutrient rich tubers, which form on underground stems (stolons). Tubers are precious due to their central role in global food security. However, little is known about the mechanisms underlying tuber formation and regarding how certain architectural plant characteristics can influence the productivity of this crop. The knowledge of the genes controlling important traits such as those involved in crop productivity and quality as well as resistance to biotic and abiotic stresses is being studied through the development of new genomic tools. The publication of the potato genome (Xu et al. 2011) has provided the physical location of more than 39,000 genes, however, there is still a lack of tools for investigating their functions other than the use of transgenic plants or the direct observation of altered phenotypes. The use of high-quality genetic mutant reference collections has shown to be an alternative to genetic transformation techniques for the characterization of essential traits in other crops. This project is using an inbred self-compatible diploid species S.verrucosum, a tuber‐bearing relative of the cultivated potato which it is inter‐fertile, to develop an EMS mutagenized population that can be used to dissect developmental and other traits that may impact directly (e.g. tuber traits) or indirectly on crop yield and quality. We have funding from the Biotechnology and Biological Sciences Research Council (BBSRC). A further goal is to utilise a novel next generation sequencing approach (Shoremap or Mutmap) (Abe et al. 2012, Schneeberger et al. 2009) to identify genes (focus on traits relating to tuberisation and plant development) corresponding to previously identified mutant phenotypes. This method identifies recessive mutations using bulked samples from phenotypically mutant and wild type plants from F2 between the mutant strain and divergent genotype by using Next Generation Sequencing (NGS) data of each pair of bulks and the subsequent analysis of SNP allele frequencies across the genome. To assist this process, a high-quality draft genome sequence of the wild-type S.verrucosum genotype is being obtained through several approaches. The chosen genotype (VER54‐GW1) was selfed four times before its use in the project and we confirmed that is >99% homozygous based on SNP data. The idea is to establish this self-compatible tuber-bearing wild Mexican diploid potato species as a genetic model in order to make easier the genetics studies in potato. Furthermore, recently it has been shown that S.verrucosum is likely the ‘A genome donor to the Mexican allopolyploid potatoes’ (Pendinen et al. 2012, Cai et al. 2012) and as such quite removed taxonomically from cultivars and landraces. This Mexican allopolyploids show high levels of resistance to Phytophthora infestans, encoded by several R genes so by having S.verrucosum as a ‘model potato species’ can be very advantageous for forward/reverse genetic studies but also for deciphering the evolutionary history of blight resistance in allopolyploid (e.g. S.demissum, S. stoloniferum, S.papita, etc) potato species. So far we have obtained sequencing data from four different Illumina libraries (PCR-free tight size selection: 100 or 150bp, insert size 600 bp; PCR-free DISCOVAR: 250 bp, insert size 500 bp; Nextera Long Mate-Pair: 250bp, insert size 10,000 bp). We have integrated Nextera LMP libraries into a DISCOVAR de novo assembly and used the Dovetail artificial HI-C protocol to get: (a) DISCOVAR contig N50 75Kbp (b) LMP scaffolded N50 800Kbp and (c) Dovetail N50 4.3Mb. The genome assembly size up at this point is approximately 650Mb. Despite the high amount of Illumina data obtained already mentioned above, we are going to produce a new assembly based just in long read data from PacBio technology, and furthermore we are already using PacBio, Hi-C (Dovetail Genomics) and Bionano data for pseudomolecule scaffolding and gap filling. One of the essential steps during de novo assembly once you have got your long scaffolds after overlapping reads to build contigs, then adding paired reads to build scaffolds, it is to order and orientate them to reconstruct chromosomes. For the last step it is necessary to use genetic maps, physical maps, cytological maps, optical maps, or synteny with related taxa to reconstruct the most likely chromosomal or also called ‘pseudomolecule’ assemblies. We have produced a Genotyping-by-Sequence (GBS) library from a verrucosum’s population composed by 103 individuals. This will allow us to get many SNPs markers across the genome for the construction of a high-density genetic map that we will anchor to the final assembly. This project builds on two research institutes, The James Hutton Institute in Dundee (Drs Glenn Bryan, PI, and Elena López-Girona, Postdoc) and the Genome Analysis Centre in Norwich (Drs Mathew Clark, Co-I, and Pirita Paajanen, Postdoc). The Hutton team has expertise in all aspects of potato breeding, genetics, genomics and molecular physiology while TGAC has experience and knowledge in genome sequencing and genome assembly. Abe, Akira, Shunichi Kosugi, Kakoto Yoshida, and Satoshi Natsume. 2012. “Genome Sequencing Reveals Agronomically Important Loci in Rice Using MutMap.” Nature Biotechnology 30(2): 174–78. Cai, Danying et al. 2012. “Single Copy Nuclear Gene Analysis of Polyploidy in Wild Potatoes (Solanum Section Petota).” BMC evolutionary biology 12(1): 70. Pendinen, Galina, David M Spooner, Jiming Jiang, and Tatjana Gavrilenko. 2012. “Genomic in Situ Hybridization Reveals Both Auto- and Allopolyploid Origins of Different North and Central American Hexaploid Potato (Solanum Sect. Petota) Species.” Genome / National Research Council Canada " 55(6): 407–15. Schneeberger, Korbinian et al. 2009. “SHOREmap: Simultaneous Mapping and Mutation Identification by Deep Sequencing.” Nat Meth 6(8): 550–51. Xu, Xun et al. 2011. “Genome Sequence and Analysis of the Tuber Crop Potato.” Nature 475 (7355): 189–95.